Talk to a team member for a quote on a custom made whiteboard, shop online or be inspired by our gallery. Then start 2019 ahead of the game! Our Branded Magnetic Leaderboards were a hit for #TafeNSW brand activations around the state this month. Well done to all the young Netballers taking part in the School Netball Challenges. Contact us today about your next competition leaderboard or Brand Activation Project. How successful Agents are managing their team sales and listings. Belle Property, Ray White, McGrath and many other successful agencies are using our custom, sales Whiteboards to effectively manage Sales, Leads, and Listings. What could this do for you and your team? Your agency and teams are busy, on the road, or the phone, so how do you cut through with up to date information, highlight sales, and push the teams to strive for success? so are your single point of contact, and offer 3 week turnaround. If you can draw, print or imagine it, we can make it - gain inspiration from other examples here. Who puts permanent lines on Whiteboards? We Do! So often we get asked... Can you put Permanent Lines on your whiteboards? That won't ever rub off?? And the answer is simple - YES! That is what we do. 1. You decide what permanent content you want on the board. 2. Our awesome studio team gets to work creating the template to the scale of your whiteboard for you to approve. 3. Once approved, our production pro's digitally print the approved design before laminating it BENEATH the whiteboard surface and completing your board with a frame (if required) before shipping it out to your chosen address. This is how the permanent graphics and lines stay permanent. You can have absolutely anything printed beneath the surface. Photos, maps, logos, plans and tables all become permanent fixtures beneath the whiteboard surface. Branded Whiteboards are Whiteboards Your Way! Branded Whiteboards are not only great for office spaces and factory walls - They are also the perfect solution for people on the move. Check out all the great Roll-Up Branded Whiteboard solutions we have come up with lately for clients wanting their board to be transportable - either from one meeting to the next, to take around a constructions sites, and even across farming properties. Whilst the students were away.. Schools were hard at work planning for the rest of the year ahead. Check out theses great Branded Whiteboards created for school sports departments over the holidays. What a great way to keep track of and easily update your schools sports records and celebrate the achievements of the students. Recently Branded Whiteboards have been helping many large scale organisations implement the use of problem solving tools in the work place with great success. Fishbone Diagrams and 5 Whys charts are a great tool for troubleshooting, problem solving and quality improvement. And they are a great template for a Branded Whiteboard. The Ishikawa diagram, Cause and Effect diagram, Fishbone diagram — all they are the names of one and the same visual method for working with causal connections. Problems are obstacles and challenges that one should overcome to reach the goal. They are an inseparable part of any business, and the success of an enterprise often depends on ability to solve all problems effectively. The process of problem solving often uses rational approach, helping to find a suitable solution. Using Fishbone Diagrams for Problem Solving is a productive and illustrative tool to identify the most important factors causing the trouble. The 5 Whys technique, originally developed by Sakicki Toyoda in the 1930s, is most effective when the answers come from people who have hands-on experience of the process being examined. It is a simple tool - When a problem occurs, you drill down to its root cause by asking "Why?" five times. The process uses counter-measures rather than solutions to prevent an issue from reoccurring. Having a Fishbone whiteboard #fishbonewhiteboardor5 Whys Whiteboard#5whyswhiteboard on hand to troubleshoot issues as they occur, with hands-on staff, is invaluable. Our studio & design team at Branded Whiteboards can work with you to create the perfect Problem Solving Tools templated on Whiteboards for your workplace. Contact us today. 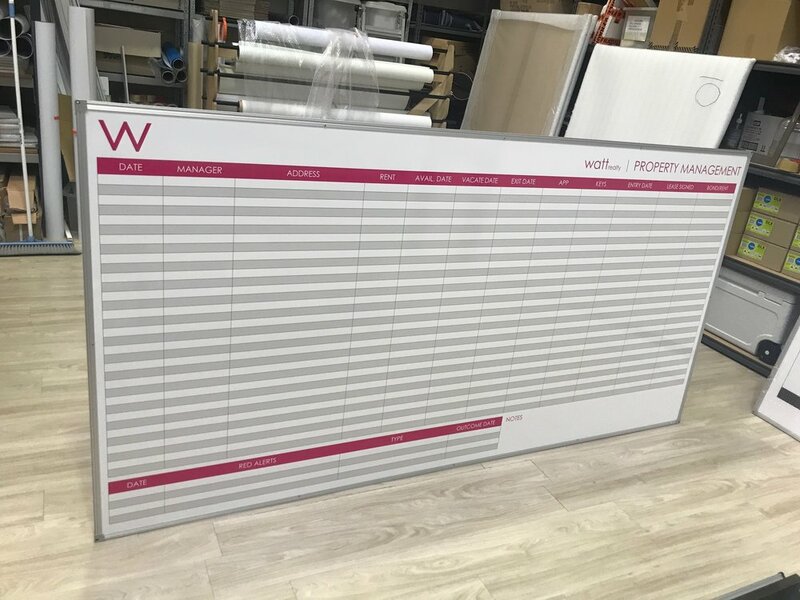 Talk to our studio team today about creating the perfect customised KPI whiteboard to motivate your sales team - Set your own sales goals, rewards or achievements to display and keep your team accountable. Prominently displaying each sales reps’ numbers in your sales room can create a motivating atmosphere and positively influence the performance of your sales team. This works because sales people are generally a competitive bunch. Additionally, such a tool enables management to hold their sales team accountable for whatever results they generate. Contact us today for a Custom Design that suits your businesses needs. Of course, whiteboards aren’t the only method for motivating greater results. Other ways that encourage good morale are words of encouragement or “shoutouts,” fist bumps and high fives for jobs well done, said Miller. It’s also been noticed that former or current athletes do well in sales because of their natural competitive drive and understanding of the mental aspect of the “game”. Instead of having cheerleaders and cleats, our sales teams have a communal gong, strategically located near the offices of the CEO and President. Yep. Every time someone closes a deal, they get to hit the swinging, metal plate to announce their successful conquest to the company at large. Miller said they have tried using other methods besides the public whiteboard to motivate the inside sales reps, including reports reps could pull up on their computers and individual, 1-on-1 discussions regarding performance. Both tactics worked to a certain extent, but none has had the same results as the public scoreboard. We have recently been working with a series of clients in the Agriculture, Agistment and Farming sectors to help them develop a range of management boards that ensure their property and businesses run smoothly 24/7. Check out the great range of uses in this collection for Wallaby Hill we have just completed.. with still more to come over the next few weeks. Sales tracking and management boards are an asset to any thriving sales business - be it Real Estate, Automotive or any other field.... But they don't have to look like this! Contact us today and we can help turn your tired old boards into something you'd be proud to hang on your office walls.